If you are a homeowner looking for various vinyl siding options and are shopping around for the best match in quality and price, you can refer to this comprehensive list of vinyl siding manufactures. Founded in the late 1940s, Alside Siding is one of the top leading siding manufacturers today. Alside Siding products are known for their exceptional durability. They offer stronger, more rigid siding systems as well as a wide range of rich, long-lasting colors and textures that capture the authentic look of wood. Alside siding can be found in more than 90 supply centers and independent distributors scattered around the country. Currently, Alside Siding is operating as a division of Associated Materials, Inc.
ABTco Siding offers homeowners vinyl siding that provides the beautiful rustic look of log siding without the high maintenance. ABTco siding has the deeply textured woodgrain and hand-stained cedar appearance of real cedar logs. Moreover, the siding has a precisely contoured underlayment making it ultra impact resistant. ABTco’s most popular products include: Cedar Creek™ (the most affordable quality siding option), Adirondack Siding System (high quality siding that will not require painting or staining maintenance) and TimberCrest® Premium Plus Siding (an upgraded system that boasts an acrylic shell finish that preserves its deep, rich color even after years of exposure to sun’s UV rays). CertainTeed Corporation is North America’s largest manufacturer of vinyl siding. CertainTeed claims has the reputation of having the broadest selection of colors in the industry and was the first to introduce darker shades. CertainTeed Siding is rated #1 in preference and brand use by building professionals. CertainTeed’s top selling products are: Encore and MainStreet(high quality, economical panel that is easy to maintain), CertainTeed Cedar Boards Insulated Siding ( upgraded version that provides added strength and thermal benefit of rigid foam insulation as well as easy maintenance). With over 60 years of experience in production and product innovation, Crane siding is a recognized leader in siding product design and manufacturing. After introducing its SOLID CORE SIDING in 1998, the company distinguished itself from competitors as a leader in breakthrough technologies in cladding aesthetics and performance. Crane’s most popular products include: Craneboard Siding (an affordable classic choice that offers versatile colors and energy efficiency, Oracle (an upgrade choice that offers an authentic, true milled cedar woodgrain and a lustrous, low-gloss finish), Architectural Essentials (a premium choice that gives your home a polished, yet handcrafted appearance). Gentek Building Products offers over 40 years of experience in the building products industry. Originally part of Alcan Building Products, Gentek currently provides an easy-to-install, superior product line combines with exceptional customer service. Gentek siding is tested to withstand hurricane-velocity winds up to 198 mph and come in 26 color options, including distinctive deeper hues. Gentek’s top products include: Aurora ( an economical choice that has clean lines, nice detail and subtle driftwood texture), Sequoia Select(an upgraded choice that offers exquisite style, exceptional durability, greater panel thickness and deeper dimension), Sequoia Select Extended Length (another upgraded choice that offers a distinctly upscale appearance with a reduced number of panel overlaps that showcase superior craftsmanship and attention to detail), Signature Supreme (premium choice siding that offers expert craftsmanship, beautiful colors, richly detailed hardwood texture and a wide range of classic profiles). Heartland Siding is recognized with the #1 Siding Best Buy AND the #1 Recommended Siding. Heartland provides homeowners with a better alternative to consumer-grade siding by offering high quality products that are on the cutting edge of siding technology. The company’s exclusive Super Polymer formulation fights fading, cracking and thermal expansion and contraction. Heartland siding is specially formulated to offer: Tri-Pigment (IR) Reflective Technology to deflect the sun’ damaging rays and a Weather Barrier Shield. Heartland’s most popular products are: Ultra Super Polymer Siding (a budget option that offers a beautiful look with a soft mill grain surface impression and low luster finish), Arbor Glen Super Polymer Siding (a standard option that offers custom cut capability with long siding lengths up to 16′ with Tri-Pigment Technology & Weather Barrier Shield), CedarMax (premium option that offers seamless custom craftsmanship, superior insulation and energy efficiency by reducing energy loss due to thermal bridging). KP Building Products is one of the largest manufacturers of building materials in North America, and was the first to produce vinyl siding. The company manufactures all of its own products, and therefore ensures the highest level of quality control. KP is renowned for offering a vast array of innovative, industry-leading vinyl siding styles, colors and “green” alternatives. KP’s top vinyl siding products are: KP Hudson Bay (economical siding that offers the look and feel of wood with specially formulated color retention technology and UV resistance additives), KP Northern Start (standard quality siding engineered for long lasting performance along with sophisticated design and color retention), KP Norman Rockwell (premium siding that offers an opportunity to make a bold statement with traditional colors such as ocean blue, barn red, or forest green). 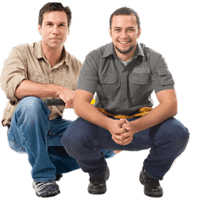 Kaykan, a market leader in vinyl siding, is a family owned and operated company for over four decades. Kaykan offers exceptional quality, distinctive style and durability and ease of maintenance. All Kaycan vinyl products are made with exclusive Duratron™ Vinyl Formula, as well as state-of-the-art processes and the highest quality raw materials. Kaykan’s top products include: Richmond (economical siding that combines ageless beauty of wood-grain texture with durability, and wind resistance), DaVinci ( high quality siding that offers premium gauge thickness for added impact resistance and special colorfast formulation locks-in the color for superior retention), Platinum (premium siding that has a smooth, low gloss matte finish for a remarkably pristine look and an exclusive Duratron™ vinyl technology that ensures weatherability and color retention). Since 1932 Mastic Home Exteriors has provided innovative and superior quality building products. In 1961, Mastic revolutionized the siding industry with the invention of the formula for contemporary vinyl siding. 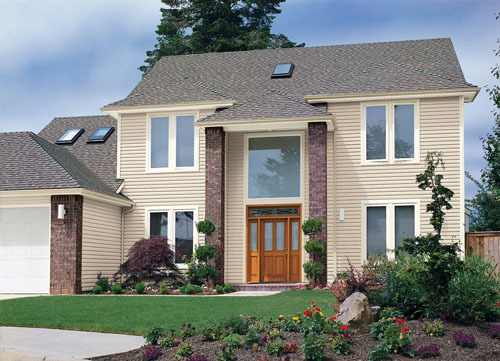 In 1989, Mastic joined with Alcoa to offer the industry’s widest selection of premium vinyl siding products. For over seven decades Mastic has been at the forefront of research and innovation in the siding industry, raising the bar high for vinyl siding’s looks, quality, performance and durability. Mastic’s most popular products include: Eclipse (economy option that provides the classic look of real wood without the hassle of upkeep), Carvedwood 44 (quality option that delivers strength, durability, and beauty of real wood, as well as excellent wind resistance up to 200 mph), Cedar Discovery Double 7″ Perfection Shingle ( premium option that offers patented full-panel side- lock, gorgeous look of real cedar shingles, superior durability and resistance to extreme weather conditions and wind upto 210 mph). Since 1963, Napco has been one of the top industry leader’s in manufacturing competitively priced high quality siding products. 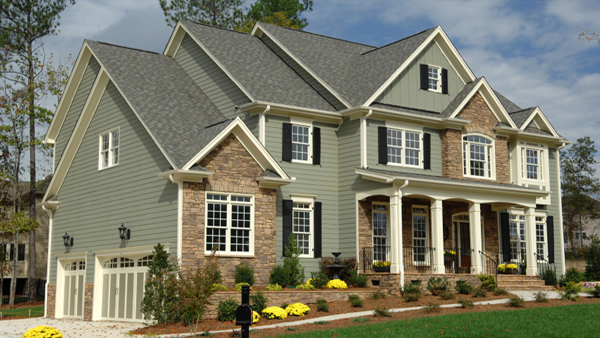 Napco manufactures an extensive product portfolio, including a number of product lines of vinyl siding. Since 1962, Vytec Siding has been focusing on quality, service and innovation. The company is committed to precision when designing and manufacturing its siding products, which is why Vytec products are in such high demand. Vytec Siding is one of a select few companies that has managed to meet the requirements set forth by both the Underwriter’s Laboratories and the Vinyl Siding Institute. Vytec’s top products include: Nantucket (economical siding that offers a full palette of rich colors, wood-grain finish gives the natural look of painted cedar and innovative panel design helps eliminate unsightly gaps), Prestige (quality siding that offers TruColor® Protection Technology, withstands harsh weather, pollutants and temperature extremes, and resists scratches and dents), Proside LG (premium siding that offers interlocking design to keeps panels securely in place, superior resistance to scratches, dents, harsh weather and temperature fluctuations, an extensive pallet of rich classic colors). WE HAVE VINYL SIDING INSTALLED ON OUR CONDOS. IN SOME PLACES IT IS BUCKLING AS IF IT WAS DAMAGED BY HEAT. NO OUTSIDE GRILLS WERE INVOLVED. WE WERE TOLD THAT REFLECTION FROM GLASS WINDOWS COULD CAUSE THIS. DO YOU HAVE ANY ANSWERS. Scott, your siding is nailed to tight, and when it expands, it cannot move, so it buckles. If panels aren’t ruined, you should either get original contractor or hire someone to unlock seams and pull nails out slightly, so panel can easily slide left and right. Thank You Leo B. I hope I described the issue correctly. All these locations are on our patios which are next to the sliding glass patio doors and no where else. Some patios are not in direct sun light. I want to use the word (warp) as a description. Although it’s been denied, I want to believe it’s a outside grill that’s been to close to the siding. Do you know of a manufacture I could call? If you represent one, thank you. Some of the info u were given is wrong. If those pieces of siding you speak of have been warped in any way they are junk an cannot be reused. It will void the warranty. Also being nailed to tight is not the only/sole reason your siding would buckle. One of the most common mistakes is nail placement in the nailing slot. To far left or right instead of directly centered. Best thing to do is get a Representative of the manufacture come an inspect it.